showing that particles with close to --that is, with velocity components along the -axis close to the phase-velocity of the wave--have velocity perturbations that grow in time. These so-called resonant particles gain energy from, or lose energy to, the wave, and are responsible for the damping. This explains why the damping rate, given by Equation (8.31), depends on the slope of the distribution function calculated at . The remainder of the particles are non-resonant, and have an oscillatory response to the wave field. To understand why energy should be transferred from the electric field to the resonant particles requires more detailed consideration (Cairns 1985). Whether the speed of a resonant particle increases or decreases depends on the phase of the wave at its initial position, and it is not the case that all particles moving slightly faster than the wave lose energy, while all particles moving slightly slower than the wave gain energy. Furthermore, the density perturbation oscillates out of phase with the wave electric field, so there is no initial wave-generated excess of particles gaining or losing energy. However, if we consider those particles that start off with velocities slightly above the phase-velocity of the wave, then if they gain energy they move away from the resonant velocity whereas if they lose energy they approach the resonant velocity. The result is that the particles which lose energy interact more effectively with the wave, and, on average, there is a transfer of energy from these particles to the electric field. Exactly the opposite is true for particles with initial velocities lying just below the phase-velocity of the wave. In the case of a Maxwellian distribution, there are more particles in the latter class than in the former, so there is a net transfer of energy from the electric field to the particles: that is, the electric field is damped. In the limit that the wave amplitude tends to zero, it is clear that the damping rate is determined by velocity gradient of the distribution function at the wave speed. The previous argument fails if the magnitude of the initial electric field becomes too large, because nonlinear effects become important (Cairns 1985). The basic requirement for the validity of the linear result is that a resonant particle should maintain its position relative to the phase of the electric field over a sufficiently long time period for the damping to take place. To determine the condition that this be the case, let us consider the problem in the frame of reference in which the wave is at rest, and the potential seen by an electron is as sketched in Figure 8.5.
where is the amplitude of the electric field. We may expect the wave to damp according to linear theory if the bounce time, , is much greater than the damping time. Because the former time varies inversely with the square root of the electric field amplitude, whereas the latter is amplitude independent, this criterion gives us an estimate of the maximum allowable initial electric field amplitude that is consistent with linear damping (Cairns 1985). 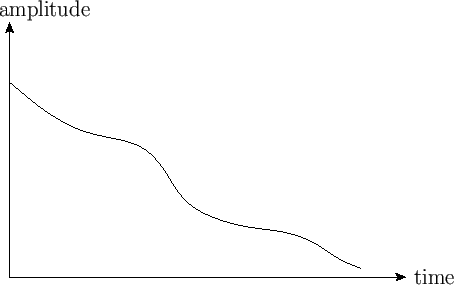 If the initial amplitude is large enough for the resonant electrons to bounce back and forth in the potential well a number of times before the wave is damped, then it can be demonstrated that the result to be expected is a non-monotonic decrease in the amplitude of the electric field, as shown in Figure 8.6 (O'Neil 1965; Armstrong 1967). 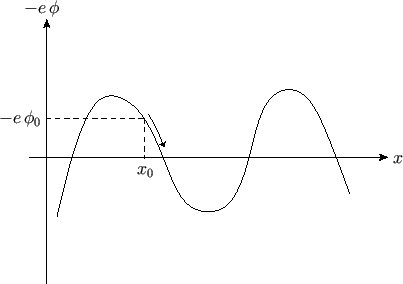 The period of the amplitude oscillations is similar to the bounce time, . Figure 8.6: Nonlinear Landau damping.